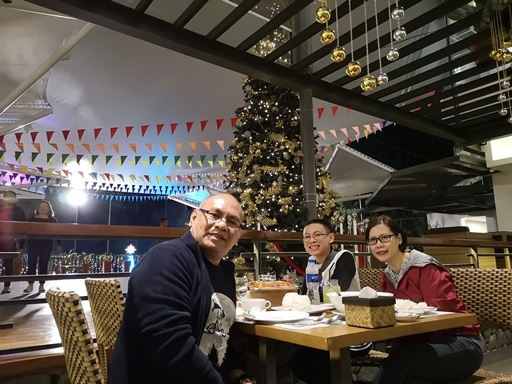 We had a very pleasant 3-day Baguio trip last December as we got to stay at Grand Sierra Pines Baguio (Sierra Pines), big thanks to the hubs for booking us there! 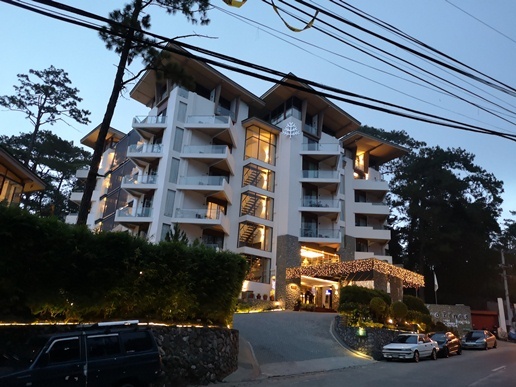 Sierra Pines is a 4-star eco-friendly hotel located on North Outlook Drive in Barangay Gibraltar, Baguio City. 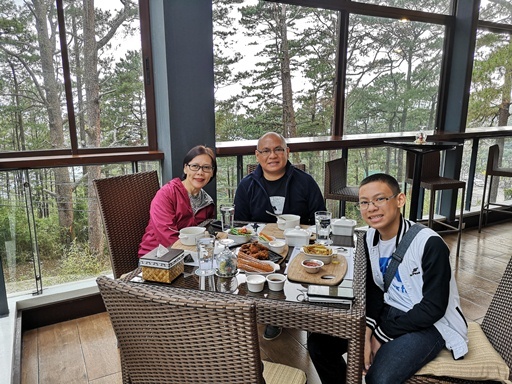 Of the four times we’ve had a family vacation in Baguio, I can honestly say that Sierra Pines is by far the best hotel we’ve stayed at in the City of Pines. 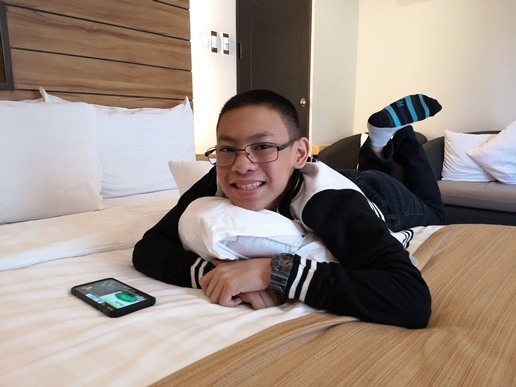 Let me tell you the many reasons why we love this hotel and why we’re looking forward to going back there again. The hotel lobby is so warm and inviting. When we arrived at Sierra Pines, Christmas was definitely in the air with real poinsettia plants adorning every nook and cranny. 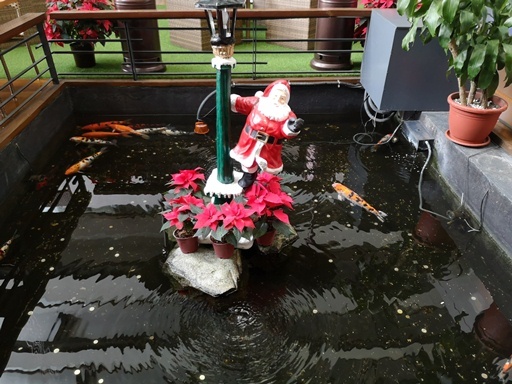 Why, even Santa struck a pose in the middle of the Koi pond on Sierra Pines’ lobby! This is the Atrium Lobby Café. Lovely, isn’t it? Open every day from 6:00 a.m. to 10:00 p.m., The Atrium Lobby Café serves delectable Pinoy comfort food at affordable prices. They also serve buffet breakfast from 6:00 a.m. to 10:00 a.m. If you’d rather have Western food, that won’t be a problem either as a few steps away from the Atrium Lobby Café is the The Outlook Steak & Grill with breathtaking view of the vicinity. Our dining experience here is now up at Delight My Appetite. Now if you’re the outdoorsy type, you’ll love it even more at Sierra Pines because they have a huge garden where you and your loved ones can play backyard games. 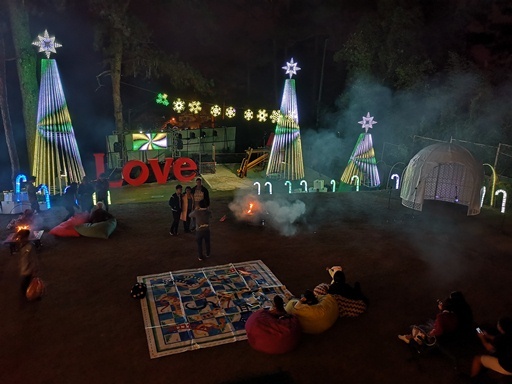 They have bonfire nights, too, at this garden to delight the vacationing guests. 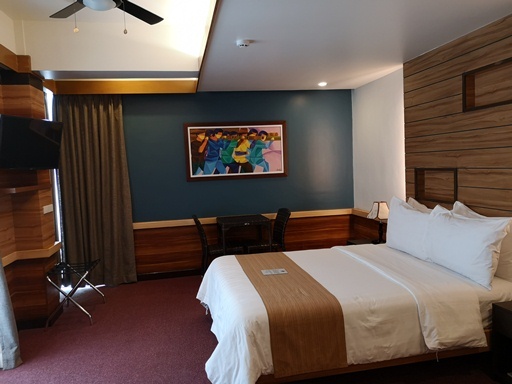 This is our Deluxe Room at Sierra Pines with a private balcony, queen-sized bed, couch, small table with chairs, LED TV with cable programming, mini bar, electric kettle, ceiling fan, air con, in-room safe, separate toilet and bath, and free Wi-Fi. It’s bright and cozy you’d actually want to stay in bed the whole day. 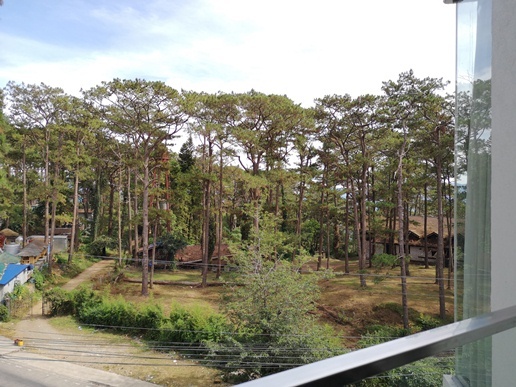 But Baguio is so lovely a place to get holed up in our hotel room, so yeah, we’ve been in and out of this relaxing haven to explore more of the country’s summer capital. This is our favorite spot in our room, perfect for picture-taking! 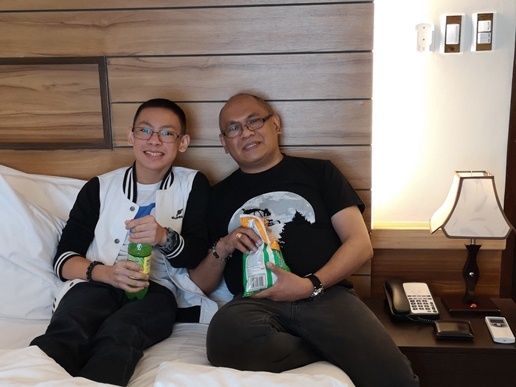 Father and son doing their most favorite thing (eating) in bed. Remove the crumbs, please! If you noticed or not, Sierra Pines is surrounded by pine trees. Moreover, Sierra Pines has a rain catcher system installed in the hotel that catches rain water. The system is connected to a pipe leading to the garden area where rain water is treated and then brought back to the cistern for the hotel’s daily use. And did I mention that the hotel staff are so polite and friendly, too? That and the other reasons I mentioned previously are what will bring us back to this very lovely hotel. The sooner we are back, the better for us! P.S. Grand Sierra Pines Baguio has its own wellness center and art gallery, too, but we weren’t able to see those during our visit. 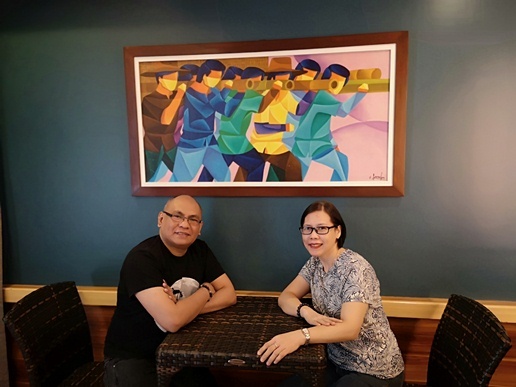 This entry was posted in Atrium Lobby Cafe, Baguio, Baguio Trip 2018, Grand Sierra Pines Baguio, Hotel Review, Hotel Staycation, Sierra Pines, The Outlook Steak & Grill. Bookmark the permalink. ← Get the Best Deals from Lazada’s Biggest Baby Fair Happening on January 22 to 24!